I was first drawn to Aurora when I saw a long thread calling it "The Dwarf Fortress of 4X Games". This is an accurate description, and your reaction to that statement is a good gauge of your reaction to the game itself. If you've ever wanted to micromanage the exploration, expansion, exploitation, and extermination of intergalactic cultures and species, Aurora will be your thing. The aftermath of a devastating (for my side) battle is as graphical as Aurora gets. Even installing Aurora 5.54 is a test of sorts; see our expanded instructions. A fairly decent tutorial for the early game is on the forums, and it is strongly recommended that anyone playing for the first time follow it explicitly. However, the tutorial is not complete, and you will invariably need to go to the forums to ask questions, such as "Why are all my colonists dying on Mars?" Answer: Because I didn't bother to pack any life support gear for them. Aurora is happy to let you dump naked colonists on an airless world, or give a ship orders it doesn't have the fuel to complete, or send a warship into battle with no missiles loaded. I imagine that Aurora giggles in delight when you do this. The only graphics in Aurora are system and galactic displays, which are mostly static and two dimensional. Your ships are represented by simple circles, marked with vector lines showing their speed and direction. Game time happens in turns ranging from five seconds to thirty days, with the player choosing how far to advance the clock each time The game will pause mid-turn if something important happens requiring your attention. This can range from a ship reporting that it's out of fuel to a huge scroll of events that detail the helpless destruction of a fleet by alien missiles. It is heartening to know that in the five seconds it took an enemy to destroy my four most powerful warships, the captain of one ship gained 0.004 points of battle skill. Oh, yes. Your ships have officers who have individual skills, so if you ever wanted to grow your own Honor Harrington or James T. Kirk, you can... just don't get too attached to them. Officers, scientists, and civilian administrators can die of illness, old age, and fusion missiles exploding in their faces. 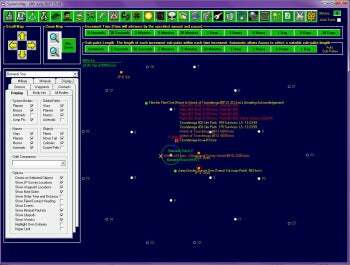 The bulk of your time playing Aurora will be spent staring at a bewildering array of screens covered with fields, checkboxes, and lists, controlling everything from mining ore to refitting shipyards to conducting research to laying out the structure of your navy. Discussions of "fleet doctrine" and "task force organization" fill the message boards. To provide an idea of how complex Aurora is, understand that in most games of this type, you may research "Missiles" and discover "Fusion Missiles" and then "Anti-Matter Missiles" and so on. In Aurora, you research root technologies, such as warhead types, ECM, fuel efficiency, and so forth, and then you design a specific missile by making selections from many different categories, and then you perform a research project to learn how to build that missile, and then you start factories producing the missiles. I should also note you must design missile launchers and magazines as well, and then put them on an appropriate ship. You must also design the tracking systems to be used by the missiles, and decide which launchers are controlled by which sensors. Also, if you don't decide to invest in armoring your magazines, enjoy watching your ship explode as soon as a lucky shot hits your missile bay. Well, to be fair, enjoy imagining watching your ship explode, since all you'll see is a text description of how two game-years of research and construction went 'boom.' And, oddly, this is where a lot of the appeal of Aurora comes from. Scott McCloud noted that we are more emotionally invested in simple images than in complex ones because our brains can fill in the detail. If you find the written space battles of David Weber more involving and exciting than the visual space battles of George Lucas, Aurora may just be your game. It would not be proper to fault Aurora for being insanely deep, complex, and unforgiving; those are its goals and it meets them. Aurora's flaws are in two main areas. The first is the extreme paucity of formal documentation, other than the tutorials. The forums can help in that, though, and the community is usually supportive. The second is that there are many bugs, often frustrating ones such as database errors, invalid file paths, and so on. Some of these have workarounds; some don't. Aurora is typical of highly personal, single-developer projects in that what gets worked on and what doesn't is very much up to the programmer. Despite the bugs, occasional bouts of hitting "30 Days" over and over while waiting for a project to complete, and an interface about as visually exciting as a spreadsheet, I personally find Aurora maddeningly compelling. I can easily spend 15 minutes tweaking the design specs of a single laser. Most gamers, even fans of complex strategy games like the Civilization series, might find the level of micromanagement, long periods of "not much happening", and the frequent errors to be enough to kill their interest. On the other hand, if you've ever said, "What I want is a game with a mechanic to simulate how well the ships of a task force work together based on the time they've conducted training exercises," then, Aurora may just be the game for you. Lose yourself in the deep gameplay and old-school graphics of Aurora.